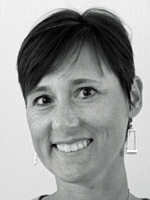 Today’ is Julie Koerber’s birthday. Some of the Flourishes Design team members and friends have decided to create a blog hop to celebrate her! She is such a wonderful woman and an amazing designer. I love everything she creates. 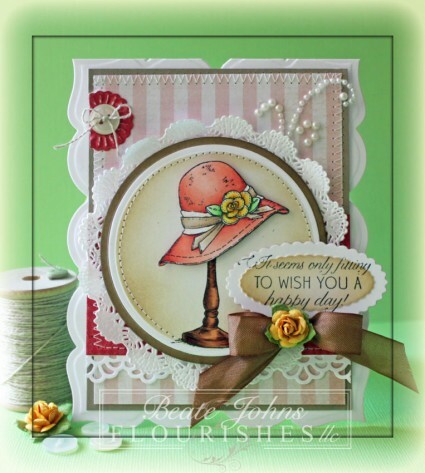 For my birthday card I thought I use the hat image from Feminine Charms. I stamped it twice in Tuxedo Black Memento Ink on Neenah Solar White cardstock. One image was cut and embossed with a Classic Circle Nestabilities die, from the other I cut out the hat. The main image and the hat were colored with Copic Markers (Hat Stand: E21, E23, E25 Hat: R00, R20, R21, R22 Ribbon: E41, E42 Flower: Y11, Y15, Y17). 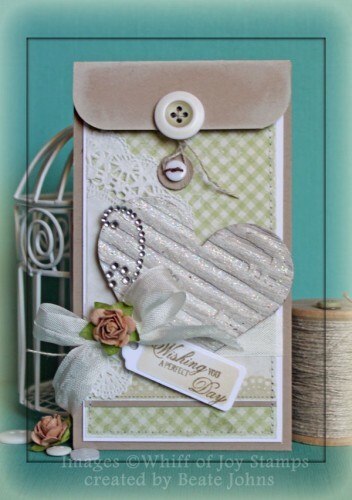 The circle was sponged with Antique Linen and Vintage Photo Distress Ink. The circle was stitched to a slightly bigger Kraft cardstock circle, that had been sponged with Vintage Distress ink. The cut out hat was adhered to the main image with dimensionals and Stardust Stickles was added over the white strip under the ribbon. 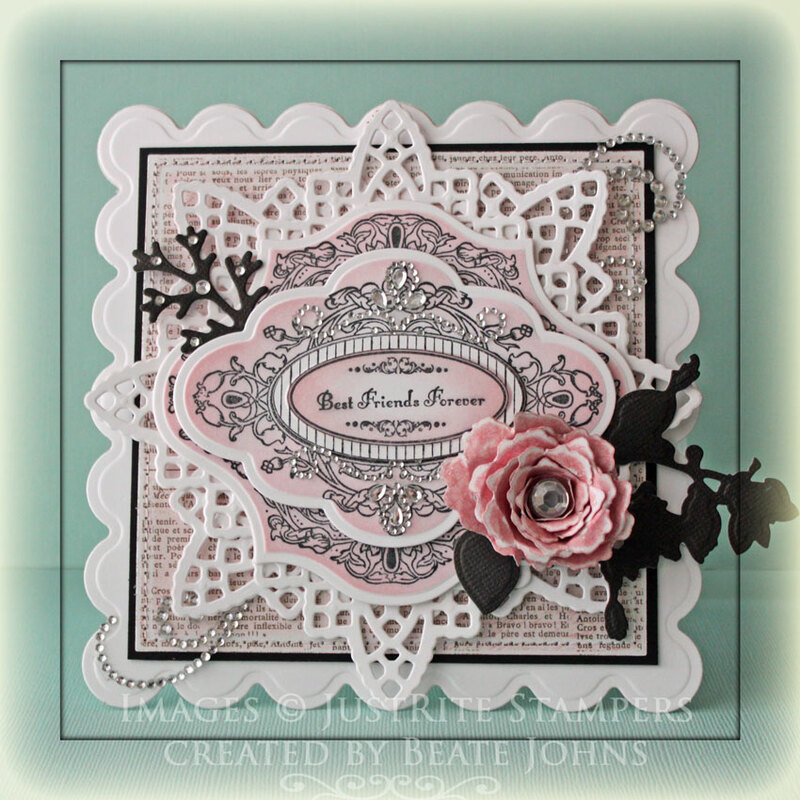 The layers were adhered over a paper doily. I used the layout from last weeks CPS sketch. A 3 5/8″ x 4 3/4″ piece of MME Lost & Found Market Street paper was adhered to a 1/4″ bigger piece of Kraft cardstock. A 3 7/8″ piece of white cardstock was cut with MFT’s Faux Crochet Border Die-namic die and adhered under a 7/8″ wide strip of Market street paper. That strip along with another 7/8″ wide strip of the same paper were adhered to the layers before the edges were stitched. 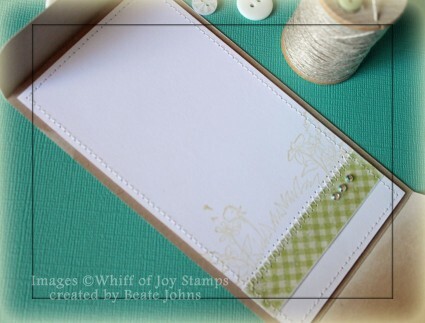 A small piece of the same paper used for the strips was cut and embossed with a Blossom Tags & Accent die. The embossed edges were sanded before it was adhered to the upper left edge of the layers. A button was tied over it with Linen Thread. The image layers were adhered to the layers with dimensionals before those were adhered to the card base, Solar White cardstock that had been cut and embossed with a Grand Label 23 Nestabilities die. Another piece of Solar White cardstock were cut and embossed with a Petite Scallop Oval Nestabilities die. 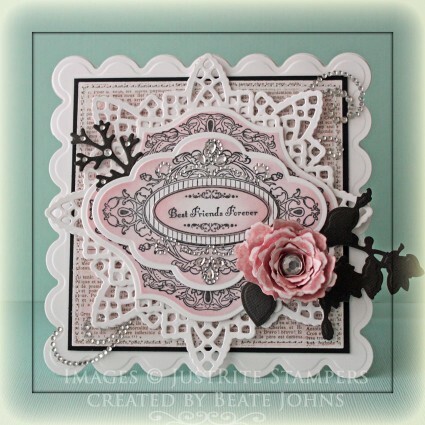 A sentiment from Feminine Charm Was stamped in it’s center with Tuxedo Black Ink and the inner part was sponged with Vintage Photo Distress Ink. The oval was adhered to the lower right of the hat image. A piece of seam binding was colored with Copic Marker E23 before it was tied into a bow and topped with one yellow flower. The bow was adhered under the sentiment panel. Part of a Finesse Pearl Swirl on the top right finish off the card. Please check out all the other birthday posts! Thanks so much for stopping by! Please hop on over to Julie to wish her a happy birthday with us!